Spotlight video puts a participant as the primary active speaker for all participants. All participants will only see this speaker as the active speaker. This feature is often used to spotlight a keynote speaker. This article covers spotlighting videos on the Zoom Desktop Client and Zoom Mobile App. Learn how to Spotlight in Zoom Rooms. 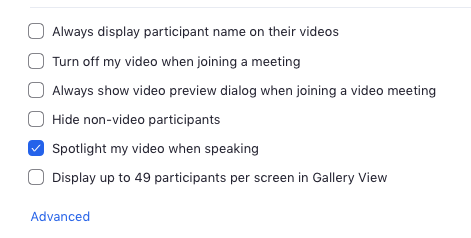 Alternatively, you can pin a participant's video, which will make them the primary speaker on your device only. Other participants will still have Active Speaker. Learn how to pin a video. From the menu, choose Spotlight Video. Click Cancel the Spotlight Video in the upper-left corner. Spotlight when I speak is a feature that will display your video on your own screen when you are in Active Speaker Video Layout and are talking. This can be useful if you are recording locally. Check Spotlight my video when I Speak. Right click on the video of participant who you want to spotlight. Tap the name of the participant you want to spotlight.